COPD is chronic obstructive Pulmonary disease where airflow becomes very limited. Pulmonary Fibrosis is where the tissue in the lungs becomes scarred. COPD is a chronic obstructive Pulmonary disease in which the airflow is greatly limited, and it often consists of both symptoms of emphysema and bronchitis. People struggle to breathe with the condition which worsens over time. Symptoms include a productive cough, difficulty in breathing, wheezing, hyperinflated lungs, and a barrel chest. As the disease progresses patients may use accessory respiratory muscles to breathe and they may also appear cyanotic. Diagnosis is based on a physical exam, chest X-rays and Pulmonary function tests. The Pulmonary function tests show the airway limitation and give an indication of how severe the problem is. The most important cause of COPD is cigarette smoking over a long period of time. The alpha-1 antitrypsin disorder, which is a genetic disease, is a cause among people who do not smoke. People who have the alpha-1 antitrypsin disorder are at increased risk of developing COPD. Cigarette smoking over many years and exposure to smoke through cooking or similar activities are also risk factors for COPD. Complications can occur in people with COPD if they become infected with bacteria such as Haemophilus influenzae. Repeated bacterial infection can increase the inflammation and progression of the COPD. Life expectancy with COPD varies from 8 to 14 years depending on the stage of the disease. Not smoking cigarettes or stopping smoking, and avoiding exposure to smoke can help to prevent COPD. Treatment can include using bronchodilators and corticosteroids. Oxygen therapy may be needed in some cases, and eventually, a person may require a lung transplant. What is Pulmonary Fibrosis ? Pulmonary Fibrosis is the condition in which lung tissue becomes scarred such that breathing becomes difficult. Symptoms include a nonproductive cough and difficulty breathing, at first, the difficulty in breathing occurs when exercising. Patients may feel very tired and have clubbing of their toes and fingers. Muscle aches may occur and patients may lose weight. Diagnosis is based on a combination of a physical exam noting symptoms, hearing crackles in the lungs and the use of a high-resolution CT scan. Chest X-rays also show findings such as opacities and honeycombing, and the CT scan shows opaque regions as well. Often the exact cause of Pulmonary Fibrosis is not known. Genetics and environment may play a role in the development of the disease. Some environmental polluting agents such as dust may cause the disease, including metal dust such as silica. In some cases, medication can cause the condition. For instance, certain chemotherapy medicines such as bleomycin and methotrexate can trigger Pulmonary Fibrosis . Research has suggested that metal dust, such as silica and alumina, and wood dust are risk factors for developing Pulmonary Fibrosis . Studies have also indicated that smoking cigarettes and certain viruses can also increase the risk of a person developing Pulmonary Fibrosis . Viruses such as Epstein-Barr, Hepatitis C, and HIV are speculated as being possible risk factors for later development of Fibrosis of the lungs. Some genetic mutations also appear to increase a person’s risk. The condition of Pulmonary Fibrosis leads to death within 4 to 5 years. A person should limit their exposure to harmful dust in the environment. This means that protective masks should be used as much as possible. Medication can be given to try to slow down the Fibrosis . Drugs such as pirfenidone and nintedanib are often used. Patients can be given oxygen to help lung function, and people younger than 65 may be able to get a lung transplant. Difference between COPD and Pulmonary Fibrosis ? COPD is a chronic obstructive Pulmonary disease where the airflow becomes restricted. Pulmonary Fibrosis is the condition in which there is scarring of the lungs. COPD has symptoms such as wheezing, difficulty breathing, productive coughing, hyperinflated lungs and having a barrel chest. In comparison, Pulmonary Fibrosis has symptoms of difficulty in breathing, nonproductive cough, fatigue, clubbing of fingers and toes, weight loss, and muscle aches. The condition of COPD is diagnosed based on a physical exam and chest X-rays showing hyperinflated lungs. The condition of Pulmonary Fibrosis is diagnosed by physical exam and X-rays and CT scans showing areas of opacity and honeycombing in the lungs. The causes of COPD are cigarette smoking and having the genetic condition of alpha-1 antitrypsin disorder. The cause of Pulmonary Fibrosis is often exposure to dust from heavy metals, but in some cases is unknown. Genetics and chemotherapy medicines can also be a cause of the Fibrosis . Risk factors for COPD include having the alpha-1 antitrypsin disorder and smoking cigarettes. Risk factors for Pulmonary Fibrosis include breathing in metal dust, cigarette smoking, genetic mutations, and some viruses. The life expectancy of people with COPD is 8 to 14 years, while the life expectancy of people with Pulmonary Fibrosis is from 4 to 5 years. COPD is treated with bronchodilators, corticosteroids, supplementary oxygen, and lung transplant. 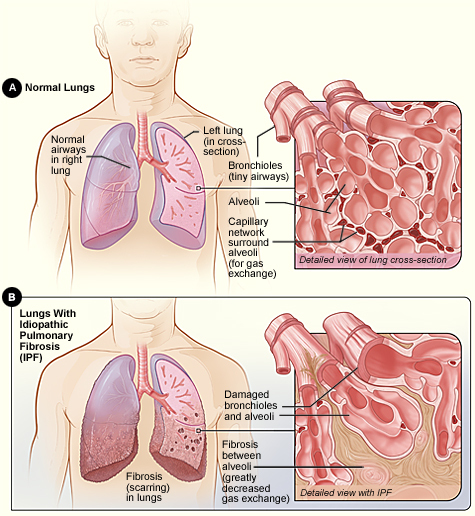 Pulmonary Fibrosis is treated with medications: pirfenidone and nintedanib, supplementary oxygen, and lung transplant. The COPD and Pulmonary Fibrosis are both conditions that can lead to death as they seriously affect breathing ability in people. Smoking cigarettes is a risk factor for both conditions. COPD can be diagnosed based on a chest X-ray as can Pulmonary Fibrosis . Patients with COPD or Pulmonary Fibrosis may require a lung transplant in order to survive. Dr. Rae Osborn. "Difference Between COPD and Pulmonary Fibrosis." DifferenceBetween.net. November 26, 2018 < http://www.differencebetween.net/science/health/difference-between-copd-and-pulmonary-fibrosis/ >. Baumgartner, Kathy B., et al. "Occupational and environmental risk factors for idiopathic Pulmonary Fibrosis : a multicenter case-control study." American Journal of Epidemiology 152.4 (2000): 307-315. Tsakiri, Kalliopi D., et al. "Adult-onset Pulmonary Fibrosis caused by mutations in telomerase." Proceedings of the National Academy of Sciences 104.18 (2007): 7552-7557.